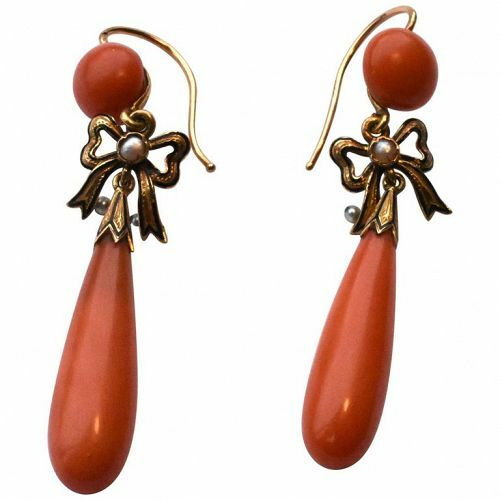 Lovely polished coral earrings with enamel bows and seed pearls ensconced in the center if each bow and dangling from each ribbon. The deep rose pink color of our earrings are the most ought after color of coral and are particularly vibrant in tone. The use of coral in jewelry started in Roman times, and where the superstitions about coral began. Coral was thought to be a talisman against evil spirits. Its popularity continued into the Middle Ages and again into Victorian times, when coral was considered appropriate for day wear. The combination of the deep rose pink color against the enameled bows and seed pearls makes these earrings a winning combination.